Ages 3 and up. 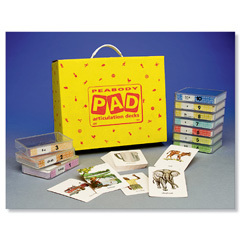 This deck, from the Peabody Articulation Decks, includes picture cards designed specifically for teaching the /sh/ and /ch/ sounds These cards are great for children with articulation disorders. The deck comes in a durable plastic box and includes 40 wipeable picture cards, a word-list card, 2 response cards, and 5 blank cards. No discount codes will be applied to this item because it is already significantly discounted - Save money now!